Given the fragile nature of the Sirisena-Wickremesinghe Govt. and the crowd pulling capacity of Mahinda Rajapaksa, will New Delhi re-position itself to a state of preparedness to interact with him at Sri Lanka’s helm again? Vesak festivity in Sri Lanka acquired an international dimension this year with the Island nation hosting the United Nations International Vesak day. The icing on this Vesak event cake was the participation of Indian Prime Minister Narendra Modi as chief guest in the celebrations. Even though President Maithripala Sirisena and Prime Minister Ranil Wickremesinghe basked in the glow of Narendra Modi’s brief trip described officially as a “religious visit”, the political highlight of the Indian premier’s stay in Sri Lanka was the nocturnal rendezvous with former Lankan President Mahinda Rajapaksa. The meeting between Modi and Rajapaksa was held late at night on Thursday, May 11, 2017. The meeting came as a surprise to many because it was not part of the original itinerary devised for Prime Minister Modi in Sri Lanka. Moreover, the possibility of such a meeting seemed very remote as the political group headed by Mahinda Rajapaksa known as the “Joint Opposition” had been harshly critical of Modi’s visit to Sri Lanka. In fact, one of the opposition leaders had called for the hoisting of black flags to protest against Modi in the presence of Mahinda Rajapaksa at a May Day rally. It was politically unlikely that the avowed leader of the Joint Opposition would have a “friendly” meeting with a foreign leader, who was being critically targeted by his loyalists. Against this backdrop few would have envisaged that Mahendra would be meeting with Narendra. Nevertheless the meeting did take place and that too at the request of Rajapaksa himself. But then Sri Lanka is a land of political paradoxes. The unscheduled meeting took place at the official residence of the Indian High Commissioner in Colombo on Munidasa Cumaratunga Mawatte (Formerly Thurstan Road) known as “India House”. President Sirisena had hosted a banquet in honour of Premier Modi on Thursday, May 11. Mahinda Rajapaksa called on Prime Minister Modi after the banquet later that night. “As always, a cordial meeting with PM Narendra Modi. Happy to see him in Sri Lanka for International Vesak Day Celebrations”. Mahinda Rajapaksa was accompanied by two persons. One was his younger brother and former Defence Secretary Gothabaya Rajapaksa. The other was ex- Foreign minister and current Podu Jana Peramuna party Chairman, Prof Gamini Lakshman Peiris. Also present on the Indian side were India’s National Security Adviser Ajit Doval, India’s Foreign Secretary Dr. Subramaniam Jaishankar and the Indian High Commissioner in Sri Lanka, Taranjit Singh Sandhu. According to Informed sources the meeting was in two segments and had lasted 40 minutes. In the first segment of 25 minutes both Modi and Rajapaksa had been conversing within earshot of the others. However, the others had not participated in the talks apart from answering a few queries put to them occasionally. The second segment of fifteen minutes had been a strict one-on-one exchange of views between Mahinda Rajapaksa and Narendra Modi. According to informed sources a vibrant spirit of bonhomie exuded throughout the conversation between both leaders. Despite the negative political currents preceding Modi’s Lankan visit, the unscheduled meeting with Rajapaksa went off very well. The conversation had started off on a promising note, when Rajapaksa apologised to Modi for meeting him late in the night and remarked that the Indian Premier would be very tired due to his hectic schedule. Narendra Modi with a disarming smile responded “Yes, I am tired, but when I see you my tiredness vanishes”. Rajapaksa beamed. According to some, Prime Minister Modi seemed to be visibly happy to meet with and talk to the ex-president of Sri Lanka. Thereafter the meeting had continued positively. The body language between both suggested a sense of relaxed confidence. They touched upon sensitive, prickly issues in a calm and composed manner airing their views amiably. Modi inquired about the Chinese role in Hambantota and Mahinda answered him in detail. Likewise Modi took great pains to explain that the recent Memorandum of Understanding signed by both countries with emphasis on Trincomalee was in no way a threat to the unity and sovereignty of Sri Lanka. Rajapaksa also tried to clarify the position of the opposition in calling for a protest during Modi’s visit and stated that it was by no means an instance of personal antipathy towards the Indian Premier. Modi listened attentively and then said that he understood the political dynamics of the situation. The meeting concluded satisfactorily with Modi inviting Rajapaksa to visit New Delhi for further conversation and Rajapaksa accepting the offer. Mahinda’s “Gamana” to New Delhi is likely to take place very soon. Mahinda’s meeting with Modi had its inevitable fall -out. There was much curiosity and excitement in the country. After all it was only ten days ago on May 1st that Mahinda’s political lackey, Wimal Weerawansa, the National Freedom Front leader had called for a black flag protest during Modi’s visit during Vesak. Mahinda Rajapaksa was on the same platform then and had said nothing thus implying that he was in agreement with the call. Moreover, opposition politicians and sympathetic analysts had been extremely critical of India and Modi. Some had even charged that Modi was trying to annex Sri Lanka through an insidious agenda and make it an Indian puppet state. It appeared from the orchestrated India trashing and Modi bashing that Mahinda Rajapaksa and his political acolytes were going to use the India and Modi card to whip up support for their political campaign against the Sirisena-Wickremesinghe Govt. Narendra Modi was going to be the whipping boy. But now in a flagrant volte-face the “Medamulana Machiavelli” had sought a meeting with the so-called ‘enemy’ and engaged in cordially conversation and amicable dialogue. What a contradiction! President Sirisena was quick to exploit the issue. He revealed that the Indian High Commissioner had told him of the ex-president’s request to meet the Indian PM and that he had told the envoy to accede to the request. The President ridiculed this disconnect between public posture and private discourse. With Beijing and New Delhi competing for greater influence over the strategically located Island in the Indian ocean, a successful visit by the Indian Prime Minister would have effectively conveyed the “message” that notwithstanding recent inroads made by China, it was India that held sway in Sri Lanka as the pivotal and naturally pre-eminent power in South Asia. He observed sarcastically that those who wanted the people to hoist black flags and demonstrate against the Indian PM were clandestinely meeting Modi at night. Mahinda Rajapaksa’s loyalists and political comrades were also flabbergasted by news of the meeting. The unkindest cut of all was that except for a few, most political stalwarts in the Medamulana camp were totally in the dark about the meeting which occurred during the darkness of night. A well-informed fellow traveller of the Mahinda camp revealed that even senior political leader of the Joint Opposition Dinesh Gunawardane was not told of the meeting prior to being held. In characteristic “Kurakkan Sataka” style, Mahinda Rajapaksa had neither informed the Joint Opposition leaders before the meeting nor briefed them in detail afterwards. These acts of commission and omission by Mahinda have caused much embarrassment to the “Apey Mahinda” fan club particularly to those at the forefront of anti-Modi agitation. However, there is very little anyone can do about the “fait accompli” at this stage except to fret and fume. An articulate member of this group told this columnist “I guess I voice the ire of the JO at the unilateralism of the Rajapaksas”. 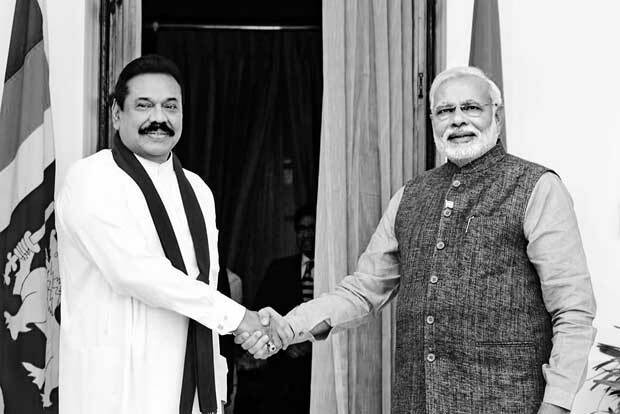 What then led to Mahinda’s meeting with Modi? Technically it is correct that it was the former President, who made the formal request for the meeting. However, it appears that Kautilyan machinations were engineered by India’s South Block “Brahmins” (not a casteist reference) to bring about such a meeting to help contain the rising tide of potential anti-Modi protests. According to informed sources two persons in the Mahinda camp were tapped. One was an ex-minister and Rajapaksa sibling with connections to Bharat. The other an intellectual heavyweight was also a former Minister. They were both asked to interact with Mahinda Rajapaksa on this matter. Indian officials had been worried about the negative implications of widespread anti- Indian and anti- Modi protests during the course of the Modi Vesak visit. From an Indian perspective the entire visit was to be a gigantic public relations exercise aimed at winning the hearts and minds of Sri Lanka’s majority Buddhists. There was no trip to Jaffna or sensitive Trincomalee on the agenda. The emphasis and focus was on the common heritage of Buddhism. While the Modi trip was overtly a “religious visit” there was an underlying politico-diplomatic objective also. This envisaged politico-diplomatic exercise could have turned into a great disaster instead of a triumph if there had been massive anti- Modi protest demonstrations. The huge crowds at the Joint Opposition May Day rally at Galle Face Green had demonstrated the power of the Rajapaksa camp. The stoppage of work by Petroleum employees protesting the alleged “hand-over” of Trincomalee to India had illustrated the capability of trade unions controlled by the Opposition to virtually paralyse the nation. If the protests got out of control resulting in violence or if the Sri Lankan law enforcement authorities resorted to force to suppress the protests, the trip could turn politically counter-productive for Modi and reflect badly upon India internationally. As such India was averse to any mass protests or demonstrations against Modi, while he was expected to be in Sri Lanka. There was also the chance of an Island -wide black flag protest taking place without any likelihood of violence. The visual spectacle of black flags against Modi would have undermined India’s image drastically. Of course there was always the possibility of a black flag protest turning into a damp squib on account of Vesak. Buddhists would not like to raise black flags during Vesak in general and particularly at a time when International Day of Vesak was being observed proudly in Lanka. Moreover, it was doubtful whether Sri Lankans were in a mood to campaign vigorously against Modi at the present juncture. Even some Joint Opposition politicians had been lukewarm in responding to the call for a black flag protest when made by Weerawansa. However, India could not take any chances and had to take pre-emptive measures to avert protests. It was with this objective that Indian officials initiated covert, unofficial moves to win over Mahinda Rajapaksa and neutralise potential anti-India protests. As stated earlier, efforts were made to interact with and win over Mahinda Rajapaksa through two intermediaries. Apparently there was very little need for persuasion because Mahinda Rajapaksa being a consummate politician was realistic enough to understand the limits of anti-Indianism at this point of time. Turning a blind eye or deaf ear to rhetorical anti - Indian criticism could be a tolerable gamble but engaging in active anti -Indian protests was akin to skating dangerously on thin ice. Even on earlier occasions, Mahinda had been somewhat critical of secret agreements with India but had not condemned India outright. Thus Mahinda Rajapaksa was ready, able and willing to be amenable when the overtures were made to him. Mahinda made the obligatory “request” for a meeting with Modi and took G.L. Peiris and Gotabhaya along with him but refrained from keeping others in his camp informed. Manoeuvres made by the land of Kautilya to wean away Mahinda from his strident anti-Indian allies, seems to have succeeded even before Modi’s arrival in Sri Lanka. Despite Weerawansa’s call for a black flag demonstration and other related demands hostile to India, the anti-Modi campaign never gathered momentum. In fact it never got off the ground. The main reason for this was the lack of interest or lethargy shown by Mahinda Rajapaksa in pursuing or encouraging this campaign. Anticipating correctly perhaps that rapprochement with New Delhi was a distinct possibility, the ex-President shrewdly avoided exacerbation of tensions with India. Thus not a single black flag was visible when Narendra Modi was in Sri Lanka. Our sister publication Sunday Times even had a photo of Weerawansa’s towering mansion at Hokandara without any black flag defying the breeze. Mahinda Rajapaksa is the sun around which the Joint Opposition’s lesser planets revolve. Once he opted out of the anti-Modi mode the whole thing simply fizzled out. The Indians had smartly calculated that Mahinda was ripe for reconciliation and played their cards deftly. 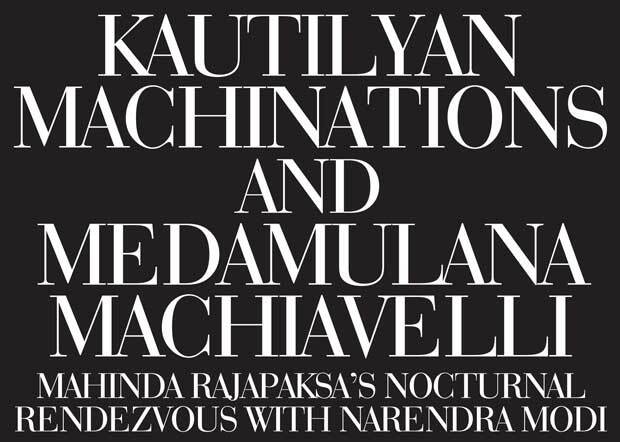 Likewise the Machiavelli of Medamulana also may have gauged Indian thinking correctly and in an adroit gambit sacrificed his pawn Weerawansa. The Rajapaksa regime’s relations with India had soured to some extent after Ajit Doval became national security adviser under Prime Minister Narendra Modi. There was much friction between Ajit Doval and Sri Lanka’s former Defence Secretary Gotabhaya Rajapaksa. The bone of contention was Sri Lanka’s perceived closeness to China. There was simmering tension between India and Sri Lanka due to this. A flashpoint of tension was triggered off by the visits of Chinese nuclear submarines to Colombo. Relations deteriorated at a subterraneous level to the extent where the Rajapaksa regime suspected the Indian espionage agency -Research and Analysis Wing (RAW) - of conspiring to topple Mahinda and bring about regime change in Sri Lanka. The then Defence secretary Gotabhaya Rajapaksa complained to Indian national security adviser Ajit Doval about the RAW station chief in Colombo, K. Ilango, who was functioning as Minister Counsellor at the High Commission. Ilango was transferred back to India shortly before the 2015 Presidential poll. India however denied any RAW involvement in Sri Lanka and maintained that Ilango’s transfer was a routine affair as the diplomat had served for three years in Sri Lanka. If the RAW station chief had indeed plotted a regime change then K. Ilango’s transfer appeared to be a case of shutting the stable door after the horse had bolted. The 2015 January 8 election saw Mahinda Rajapaksa being defeated by Maithripala Sirisena. Details of RAW involvement and expulsion of its station chief was first scooped by our sister paper Sunday Times of December, 28, 2014. A January 17, 2015 dated Reuters report filed by John Chalmers and Sanjiv Miglani provided extensive and interesting details of the alleged exercise by the RAW in bringing about regime change in Sri Lanka. “Sri Lanka expelled the Colombo station chief of India’s spy agency in the run-up to this month’s presidential election, political and intelligence sources said, accusing him of helping the opposition oust President Mahinda Rajapaksa”. “An Indian foreign ministry spokesman denied any expulsion and said that transfers were routine decisions. Rajapaksa, voted out of office in the January 8 election, told Reuters he did not know all the facts, while the new government in Colombo has said it is aware of the reports but cannot confirm them. But several sources in both Colombo and New Delhi said India was asked to recall the agent in December for helping gather support for Maithripala Sirisena after persuading him to ditch Rajapaksa’s cabinet”. 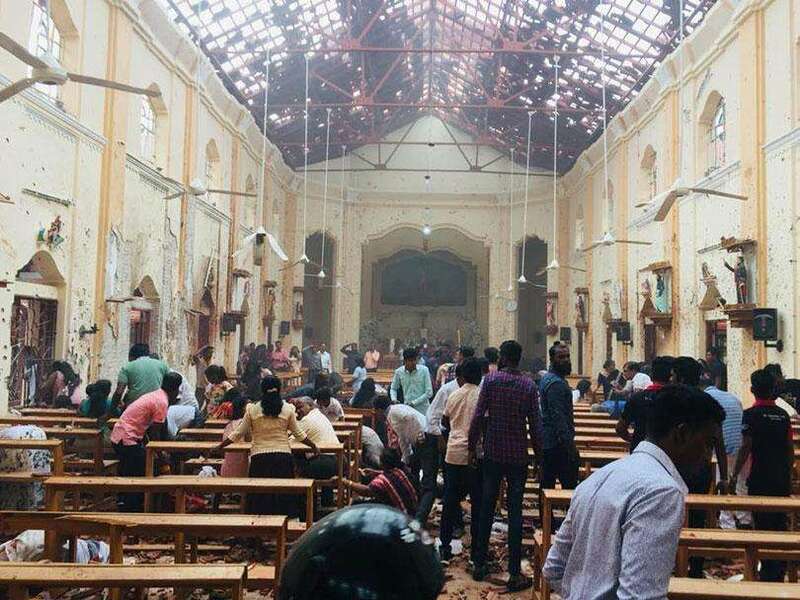 “A sketchy report in Sri Lanka’s Sunday Times newspaper on December 28 said that “Links with the common opposition” had cost India’s Research and Analysis Wing (RAW) station chief his job in Colombo”. “India has often been involved in the internal politics of the small island nation off its southern coast - it sent troops there in 1987 in a botched effort to broker peace between the Government and Tamil Tiger rebels. Rajapaksa’s unexpected defeat after two terms in office coincided with growing concern in India that it was losing influence in Sri Lanka because of the former President’s tilt toward regional rival China”. “The concern turned to alarm late last year when Rajapaksa allowed two Chinese submarines to dock in Sri Lanka without warning New Delhi as he should have under a standing agreement, the sources said. Sirisena, the new President, has said he will visit New Delhi on his first foreign trip next month and has said India is the “first, main concern” of his foreign policy”. “An Indian official said the RAW agent was recalled after complaints that he had worked with Sri Lanka’s usually fractious opposition parties to agree on a joint contender for the election. Then, he was accused of facilitating meetings to encourage several lawmakers, among them Sirisena, to defect from Rajapaksa’s party, the official said. The agent was accused of playing a role in convincing the main leader of the opposition and former Prime Minister Ranil Wickremesinghe not to contest against Rajapaksa in the election and stand aside for someone, who could be sure of winning, said the officer and a Sri Lankan lawmaker, who also maintains close contacts with India”. “The agent was also in touch with former President Chandrika Kumaratunga, who was a key player in convincing Sirisena to stand, said the officer and the lawmaker, who also confirmed that the agent had been asked to leave. “They actively were involved, talking to Ranil, getting those things organised, talking to Chandrika,” the lawmaker told Reuters. Wickremesinghe, who is now Prime Minister again in Sirisena’s Government, met “two or three times” with the man identified as the agent in the months before the vote, as well as with the Indian high commissioner, or ambassador, the prime minister’s spokesman said”. “They discussed the current political situation,” Wickremesinghe’s spokesman said, but he denied that the Indians had advised him. “He does not know if he advised other politicians.”It was not clear if Wickremesinghe was aware at the time that he was meeting with an intelligence official. India’s RAW officers are usually given diplomatic posts, when assigned to foreign missions. Former President Kumaratunga did not respond to requests for comment”. “Sri Lanka’s then Defence Secretary Gothabaya Rajapaksa - a brother of the former president - complained about the agent’s activities to Indian National Security Adviser Ajit Doval in November when Doval was visiting the island nation for a defence seminar, the Indian official said”. “Another Indian official, who monitors the region for security threats, said New Delhi had been watching Beijing’s growing influence and heavy investments in Sri Lanka under Rajapaksa, who visited China seven times since becoming President in 2005. But India was stunned and angry last year when the Chinese submarines docked in Sri Lanka on two separate occasions, a step New Delhi saw as part of Beijing’s “string of pearls” strategy to secure a foothold in South Asia and maritime access through the Indian Ocean”. “The turning point in the relationship was the submarines. There was real anger,” the Indian security official said. Indian military officials said that New Delhi reminded Sri Lanka it was obliged to inform its neighbours about such port calls under a maritime pact, and Indian Prime Minister Narendra Modi raised the issue with Rajapaksa at a meeting in New York”. “In a possible sign of shifting allegiances, India’s top envoy in Colombo, High Commissioner Y.K. Sinha, presented Sirisena with a large bouquet of flowers just hours after the results were announced on Jan 9. China’s ambassador was only able to meet the new President six days later”. Following his defeat in 2015, Mahinda Rajapaksa alleged that he was overthrown as a result of an international conspiracy. He also referred to RAW involvement in his defeat at times. However, Mahinda never effectively played up the RAW angle in his defeat to the extent he could have done so had he wanted to. In recent times Mahinda began soft pedalling the issue and displayed a marked reluctance to blame the RAW or rake up the past role of RAW. Padma Rao Sundarji: “You had accused India, specifically its Research and Analysis Wing (RAW) of engineering your election defeat in 2015. How so? Mahinda Rajapaksa (laughs): “You know, I don’t want to go into the past. What’s done is done. It’s a new page now”. Padma Rao Sundarji: “If you were to return to power – either with the Sri Lanka Freedom Party (SLFP) faction that supports you or some other new party, would you want to recalibrate your relationship to India which was very tense during your years in office? “Frankly, I think both my Government and this Government and may I say even earlier Governments like that of President J.R. Jayewardene have learned lessons in geopolitics and economics! No Sri Lankan Government can fail to recognise that Sri Lanka cannot afford to antagonise the two Asian giants – China and India. We have learned our lessons by now. So it’s in our national interest to very carefully balance and maintain equilibrium between the two”. The above excerpts from the Padma Rao interview indicate that Mahinda Rajapaksa does not want to adopt an anti - Indian course and that he wants to establish good relations with India and let by-gones be by-gones. Mahinda Rajapaksa’s readiness to meet with Narendra Modi reinforces this approach further. Regardless of whether India’s RAW played a role in his downfall or not, Mahinda Rajapaksa wants to re-configure relations with New Delhi and re-align with India. Mahinda of Medamulana is presently riding the crest of a popular wave and is positioning himself for a possible return to power. He realises that India factors crucially in this quest. Even if India does not support him, India must not oppose him. Worse still, India must not try to topple him in the future, if and when he captures power. Hence Mahinda is prepared to get into India’s good books again and play ball with New Delhi. Mahinda’s perceived volte-face in abandoning his Joint Opposition allies and meeting with Narendra Modi should be viewed in this context. He played his cards close to his chest because he did not want to upset his chances of meeting Modi. Now that the deed is done he would pacify his political allies in due course after the current furor ceases. Mahinda is supremely confident that his Joint Opposition fellow politicians would see the wisdom and imperative need for re-configuring relations with India and appreciate the importance of the nocturnal rendezvous with Narendra Modi in this respect. In any case even if his allies are cheesed off with Mahinda there is very little they can do because they need him more than he needs them. Mahinda would therefore follow up Modi’s invitation and embark upon a passage to India soon. Knowledgeable Indian journalists opine that Narendra Modi enjoys an easy camaraderie with Mahinda Rajapaksa. The important multi-million dollar question at this stage is “How will India respond to Mahinda’s attempt to re-configure his relationship with India? Or will South Block be wary of Mahinda due to past experiences and prefer to entrench and strengthen the Sirisena - Wickremesinghe - Kumaratunga triumvirate? Unfolding events will provide answers in the days to come. We live in interesting times!